This month's challenge, posted on Leap Day, comes from our brilliant hosts Mary from The Sour Dough and Sara of I Like to Cook. Always curious as to what the challenge will be, I was thrilled to see they chose Julia Child's baguette recipe. 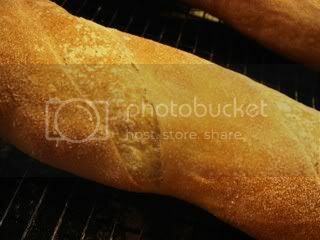 It made it even better that it was something relevant to what I am doing now, which is learning the art of the baguette. 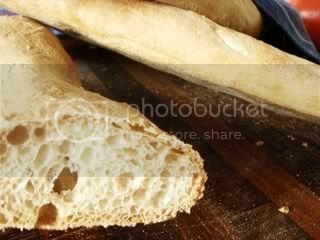 In the past, my go-to baguette recipe was ACME Baguettes from the book Artisan Baking and even though I always mean to try another, I usually stick with what I know when I need the end product to come out well. 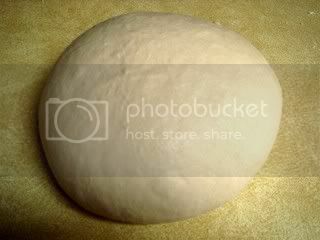 The difference between the ACME recipe and Child's recipe is the former has an old dough and poolish, as well as foldings interspersed throughout the rising time, whereas the latter is just a straight dough with two fermentations, form the shapes, then rise and bake. 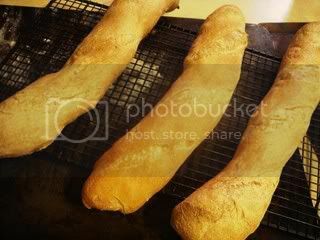 I was curious about this recipe ever since I had watched Julia Child making baguettes with Danielle Forestier in these videos. 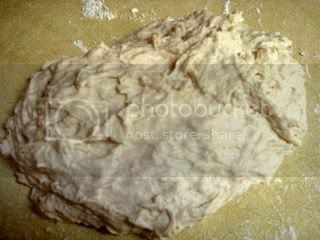 After the initial mixing and resting for a few minutes, this is what the dough looks like. Very shaggy and wet, but you can tell it's not an entirely soft dough that lacked any shape. I do not know why I couldn't tell this picture had a pinkish hue when I was editing it. Annoying. 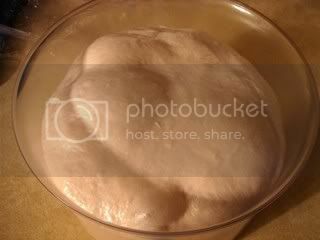 After the first rising time of 3 hours, the dough pretty much tripled in size and developed a lightness when you gently press it. 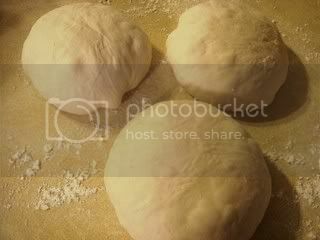 The dough is weighed into three equal pieces, shaped into a ball, and left to rest for a bit. After the folding session, which is done to develop a taut skin and help hold the shape. 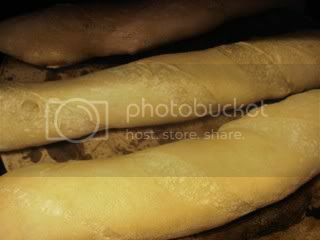 The first is a picture of the baguettes during the last water-brushing time, the second is right after the baguettes finished baking. A close-up on the crust. 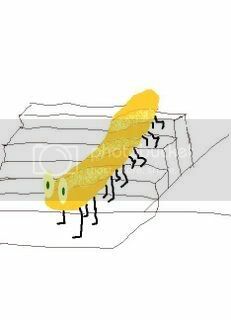 Remember the loaf of bread insect in Alice in Wonderland? This is what the insect version of a baguette would look like. Fast forward past my patience, aka the cooling time, I was anxious to see the crumb development so I sliced and stared in awe. Look at the webbing! I was very please with this recipe and am glad it was chosen. The finished product produced a crispy crust, magnificent innards with a slight fermented smell and a beautiful off-white color due to the long fermenting process. The flavor was great, too. Thanks again to Mary and Sara! Be sure to read the other Daring Baker's blogs and see what they thought of it. The link is on the sidebar. Very nice Christina! So glad you were able to do this challenge, it is great to hear your thoughts on this recipe versus your usual. mMMM! Your bread looks so delicious! The crumb is just gorgeous! 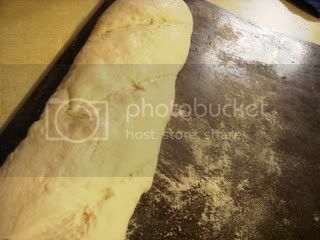 Christina, I love the bread bug and all your wonderful pictures of the whole process. I'm glad you enjoyed the whole challenge this month. Thanks so ever much for baking with Sara and I this month! Lovely crumb! Makes me want a big slice.... and I've been eating it all day! Gorgeous looking bread, Christina. They came out well! This recipe sounds difficult, but I think you pulled it off! Is that some caterpillar artwork? You are definitely a pro. 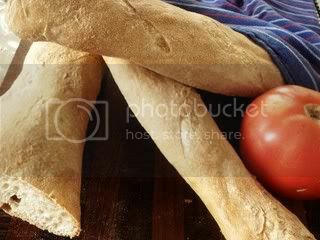 Your bread is gorgeous! Glad you enjoyed it, thanks for baking with us! I'm so jealous! 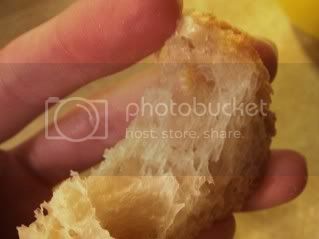 The pockets in your bread is beautiful! Mine were tight and small. Perhaps it needed more rising or may the instant yeast dissolved in water had an effect on the size of the crumb. 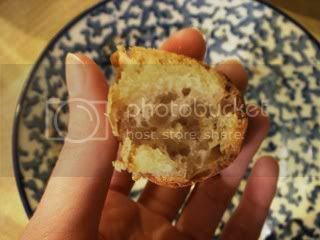 Colette - The crumb is what impressed me the most. I was paranoid (I always am with breads of these sorts) that I wouldn't get the hole structure, but I needn't have worried. Mary - It was a pleasure! You both picked a wonderful, challenging recipe. Jenny - I ate ¾ of a baguette myself, then I gave a whole one to my parents and shared the last baguette with others. Very addictive! L. Vanel - Thank you! Emiline - I had some practice with slack doughs before, so I knew to trust the kneading process and not freak out. The shaping and slashing is what I need work on, but I managed. Of course, except unlike the actual dried caterpillar I ate once, this one was more appealing! Deborah - That's very kind of you to say, I appreciate it! Sara - Again, you both picked a stellar recipe which I was glad to take part in! Valerie - I used instant yeast, actually, so I don't think that would have affected the crumb structure. I would say it was the rising time, the shaping of the dough, and/or if it deflated too much while inverting to a baking sheet or while slashing, which is what I recall happening in the past when I didn't get the crumb structure I should have gotten. 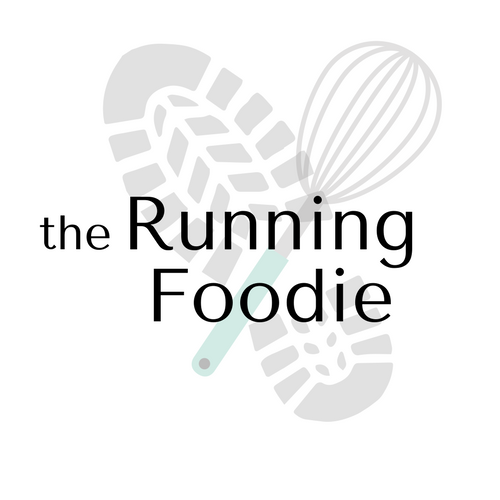 Hi, I'm a runner too:) I've been wanting to try this recipe for a long time. This is so encouraging I'm going to try it this week. I need to go buy some cake yeast first:) Have a great day! Good that you like to write, so that I know what is surely importance important for us all.